If you don’t like the Auto-Save feature of OS X, you’ll be pleased to discover that turning it off system-wide on a Mac is just a matter of checking a settings box within OS X Mountain Lion and OS X Mavericks. This will disable the automatic saving behavior for all files across all documents on a Mac. Just to clarify, auto-save tracks changes made to documents and saves them to the file automatically, thereby preventing manual saving from the File menu. This can be a major perk to many Mac users, but others find it frustrating because it may be overwriting a file or document that is in progress or being edited before changes are ready to write to the file. Simply turning off the auto-save function will prevent those file overwrites from happening, but it then requires users to manually save documents themselves, similar to how older versions of Mac OS X behaved. This setting is really a matter of personal preference, though many users are accustomed to it and would not want to disable it. The System Preference based approach to toggle the setting is much easier to use than disabling the feature in Lion through defaults writes commands and the Terminal, and with the newer approach, turning this off does not disable Versions too (Versions allows you to track changes made to files and revert back to prior versions). 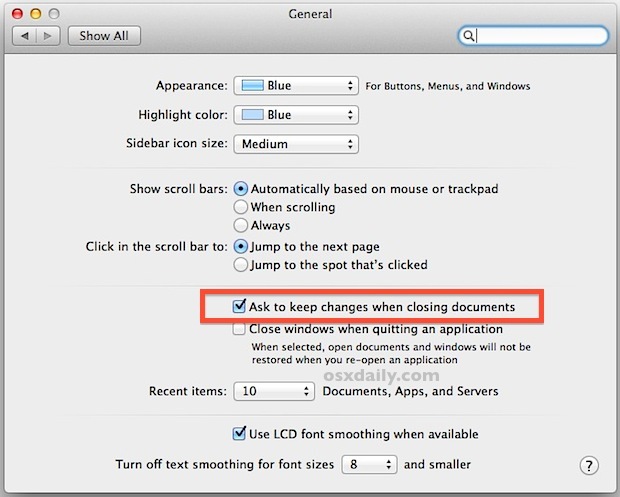 It’s important to remember how turning this off changes the behavior of OS X from the default automatic saving, to the user needing to save documents manually again. If you’re already accustomed to the automatic saving on file change behavior, it’s probably best to leave enabled. Then, if you find a file has been overwritten unintentionally, use Versions or Time Machine to roll back to a prior version of that file. Enabling the “ask to keep changes when closing documents” option doesn’t disable auto-save; it prompts you to confirm whether you want to keep the changes you’ve made to a document since you last explicitly saved it. See http://tidbits.com/article/13187 for detailed information on this subject. I noticed that with auto-save turned off, sometimes a version was *NOT* created when saving manually. It is really not wise to fight new system features to hard. In the long run, maintaining all the kluges to keep new unwanted features at bay causes more work than it saves. the rest of us should avoid any OS that saves files without prompting users _by default_. So just so we are clear. When typing up a document, tip tapping away pages upon pages of work, and you get up to go to the bathroom, and you don’t save because you will be right back, and your dog comes in and runs through your power cord and it disconnects and you lose your hours of work… that is somehow more convenient to you than having to click “file->revert to” and finding the old unedited file that you decided on second review was better? You must be reaalllllly good at doing professional level editing if your additions are so terrible that after working on them for hours you just decide to scrap them all after working to try to make the original better. Seems to me you aren’t very good at what you do if that is the case. For the rest of us, to protect our actually well thought out edits from accidental complete deletion, the inconvenience of having to click twice to find the old version in case we don’t like the new changes seems like a positive on the ol risk benefit analysis. Some of us are not simpletons like you, and can think in terms of multiple states like ‘potential changes’ or “candidate”, instead of simply “in the doc” or “not in the doc”. When something reaches a good state I’m in the habit of being responsible and hitting command-S. Or I’ll branch off to a new filename and describe what I did. I’m never in the state of “tip tapping away for hours (and unsaved)” because that’s a foolish and irresponsible way to operate. Holy crap…. autosave was RUINING some of my documents! Only _I_ know when saving is a good thing…. sometimes I absolutely do NOT want to overwrite a document with a change that I’m not too sure about. How can the computer know such things? It can’t. If only Apple had simply included an “AutoSave: On/Off” button, then me and many other would have easily found this. Why make it so cryptic? I was wondering why I was still getting the Save dialogue box…duhh! Thank you so much, helped me a lot! Save changes on close was really messing up my files sometimes. I like this auto save feature! Bummer! This should have been turned off by default in Mac OS.